Mary Anne Lamb was an English writer whose best-remembered piece of work was a collaboration with brother Charles Lamb called Tales from Shakespeare. Between them they adapted the originals to make the stories more understandable for young readers. Her literary success is, perhaps, all the more remarkable considering that she spent a great deal of her life incarcerated in mental institutions, a situation that began after she stabbed her own mother to death with a kitchen knife in 1796. 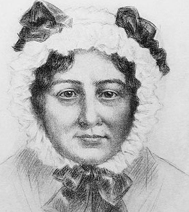 She was born on the 3rd December 1764 in London into a large family of seven children, although only Mary and two brothers survived childhood. The family lived above the premises of barrister Samuel Salt in London’s Inner Temple, her parents both working in the offices below. Mary grew up with an interest in literature and the theatre, in particular the writing of Samuel Johnson and Oliver Goldsmith and the acting of David Garrick. She found though that any educational development was interrupted due to the responsibility of providing care for both her parents after her father’s stroke and her mother’s crippling arthritis. They had moved from their Temple lodgings to a house in High Holborn. At one time Mary was looking after them and both of her brothers; Charles had suffered a mental breakdown and John an accident. The strain of this, and the supervision of a young woman who she was teaching to be a seamstress, gradually became too much for her. One evening she reacted to her mother’s anger about a fairly minor incident by stabbing her to death and this was shortly afterwards declared an “act of lunacy”. Rather than commit her to a public asylum a private institution was found in Islington and she soon admitted to her guilt over the murder although this had clearly been a result of severe mental strain on her part. By 1799 she was able to take up residence with her brother Charles and they remained together until his death, Charles calling the arrangement “a sort of double singleness”. Mary’s state of mind wavered from sanity to occasional derangement but they somehow managed to keep a close watch over each other’s problems and they made a success of their life, and writing, together. It was fashionable in London society at that time to set up literary salons and the one in the Lamb’s household was patronised by many famous writers, including Samuel Taylor Coleridge and William Wordsworth. In 1808 Mary produced a collection of tales of her own, called Mrs Leicester’s School, and this would be reprinted a number of times. Another collaboration followed two years later called Poems for Children. Their success brought them financial and social security although Mary occasionally struggled with her new life as the lady of the house, finding it difficult to manage servants. She was in a private mental institution in 1833, her mental health seemingly getting worse. Brother Charles died the following year and she found it difficult to grieve properly for him. Mary Anne Lamb somehow managed to survive without him for a number of years until her own death on the 20th May 1847 at the age of 82.
was an English writer whose best-remembered piece of work was a collaboration with brother Charles Lamb called Tales from Shakespeare. Between them they adapted the originals to make the stories more understandable for young readers. Her literary success is, perhaps, all the more remarkable considering that she spent a great deal of her life incarcerated in mental institutions, a situation that began after she stabbed her own mother to death with a kitchen knife in 1796.